Ive noticed when i have HWinfo running my voltage randomly shoots up to 1.2 even when the system is idle. I was wondering if this is normal behavior or a bug. Also HWinfo doesnt seem to able to read correct voltage from my 3570k. Debug file is in the attachment. Thanks for reading. Yes, I think this is pretty normal. Some CPUs are very sensitive even to a very light load so they raise the performance state. Why do you think HWiNFO doesn't correctly read the CPU voltage? 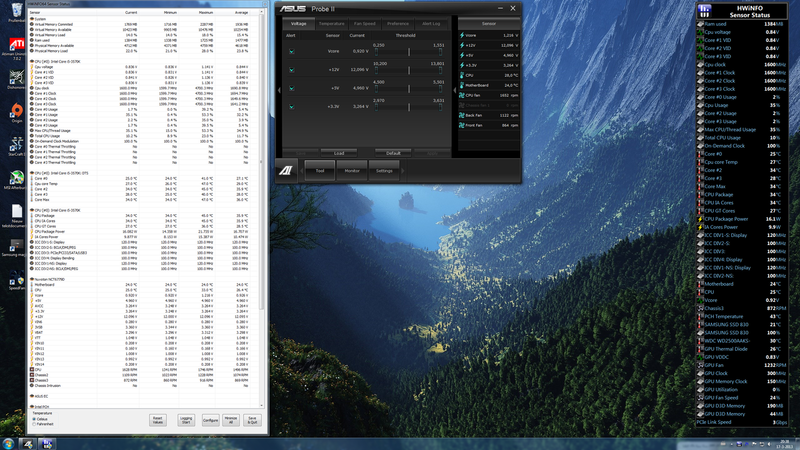 I see the numbers are consistent with ASUS PC Probe II. I was looking at the wrong voltages *facepalm*. I still find it strange that HWinfo makes my voltage shoot up and down. Without running HWinfo i can run multiple programs (utorrent downloading/uploading, twitch tv stream running in the background) and my voltage still stays nice at 0.9 with a core temp never going above 32c but with HWinfo temps go up to 48c. HWinfo isnt that demanding right? Reading from some sensors can trigger a slight load, which can cause this. But raising the CPU temperature from 32 C to 48 C seems too huge to me, to be caused by HWiNFO. You can determine this by disabling sensors (right-click and Disable Monitoring) to see if some of them is causing it. I'd suggest to start with the SMART disk sensor, because some Intel RST drivers are known to cause higher load when they are asked for SMART data. Yes, EC sensors are known to cause such issues, but since I saw on your screenshot that "ASUS EC" isn't returning any values, I thought you disabled it already (probably followed the warning displayed by HWiNFO regarding this sensor).